Here are my generous and perspicacious supporters through Patreon or Paypal (who also choose to be listed). They help make it possible for me to continue making challenging new fine art images and writing art criticism and other articles. These are roughly half my supporters, as the others prefer to remain anonymous for their own reasons. If you’d like to contribute (for as little as $1 a month), in which case I will also include you here if you choose, see the bottom of the post for super easy instructions. 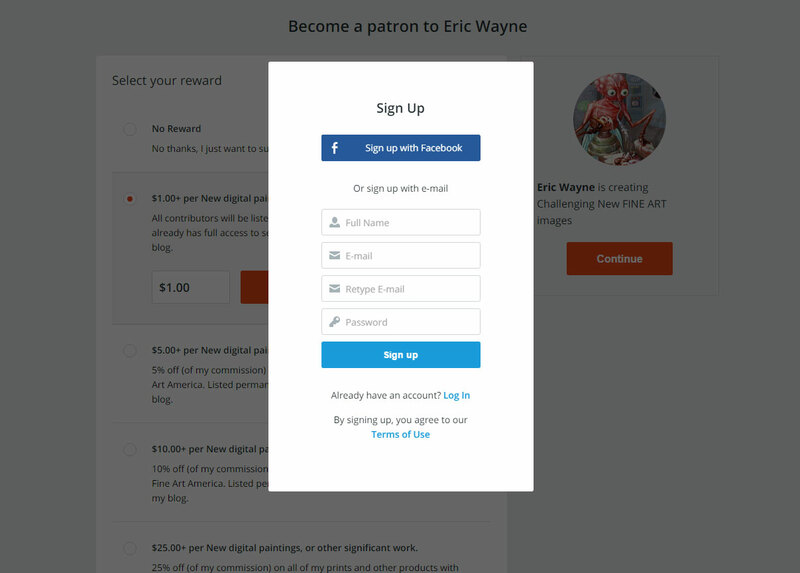 If you are one of my Patrons and I haven’t listed you, it’s because you didn’t choose that free option. Just let me know and I’ll be more than happy to include you. And if you’ve made a donation through Paypal and want to be listed, I will of course also include you. Also, if you’d like to keep your name private, you can use any pseudonym you like and be included. To support my art you only need pledge $1 a month IF I actually complete at least one significant new work during that month (if I don’t, I won’t charge you). It’s great for me, easy to do, there are no risks, and you can cancel at any time. 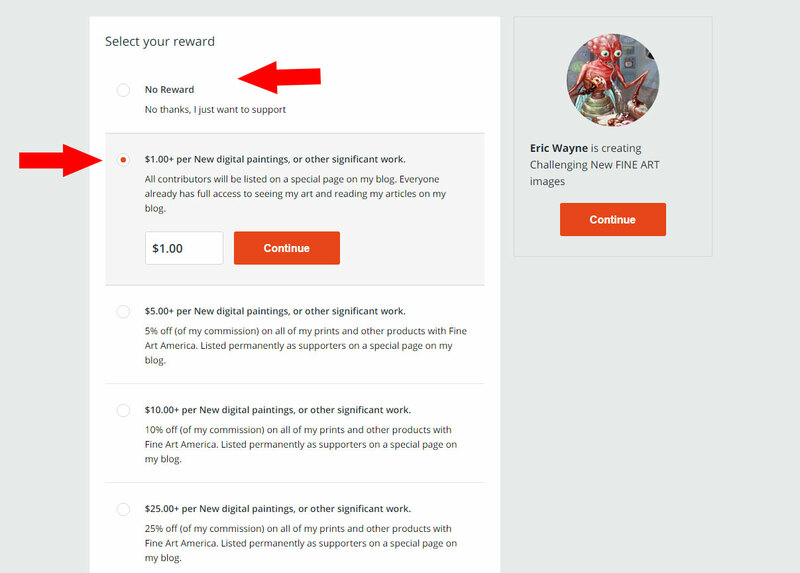 Using Patreon makes you a “patron” of the arts. Its function is to allow artists and other creative people to do their work. Patrons pledge an amount of money for each new piece an artist creates, and this can be capped at paying for just one per month. Essentially, it’s like giving a small tip for a month’s work. However, with enough tips an artist can afford to keep making art and know that as long as they are productive and churning out quality work they will continue to have funding. This gives the artist a lot of incentive. Because I live in SE Asia, and work digitally (mostly), I can be a full time artist on very little money. Even a few hundred dollars would allow me to scrape by until I get a wider audience, more recognition, and some sales. You can help make it possible for me to be free to make art full-time. Here’s how it works. I tried it out myself and it’s very simple. 1) Go to my page on the site. 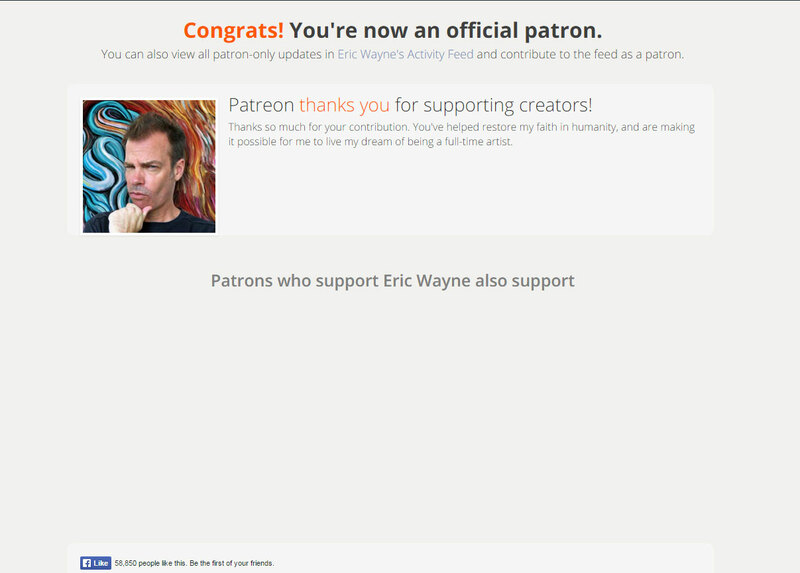 2) Click on “become a patron”. 3) Select how much you want to contribute per month. “Rewards” are just little extras you can get if you want them. If you choose “No Reward” than you can just enter any amount you want over $1. 4) Now you are prompted to create an account, which is very simple and direct, and not unlike the easier ways you’d create an account anywhere else. It really needs no explanation, but it looks like this. 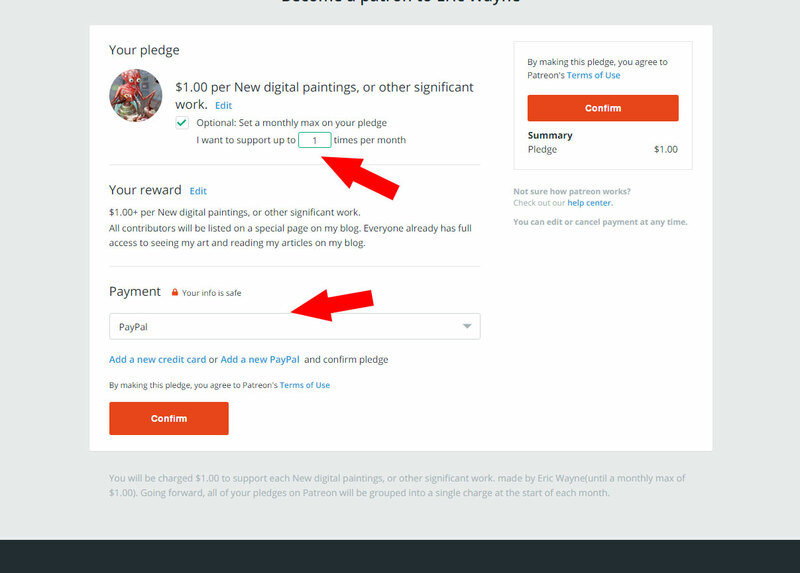 5) You “confirm” your pledge, choose if you want a monthly max on your pledge, and choose a payment method. If you have PayPal, that’s probably the easiest way to go, It’s what I tested out, and it took maybe 30 seconds, tops. You will be notified by PayPal immediately of the transaction, so you can see it’s just what it’s supposed to be. No worries. You’ve probably used PayPal before, so I don’t think I need to share screenshots for that. 6) You are done and now you are a generous patron of the arts! You can go to sleep knowing you’ve done your part to help a starving artist. 7) And just to be safe you can change or cancel your pledge any time. I’ve also tested this out myself, and it worked like a charm, instantly. 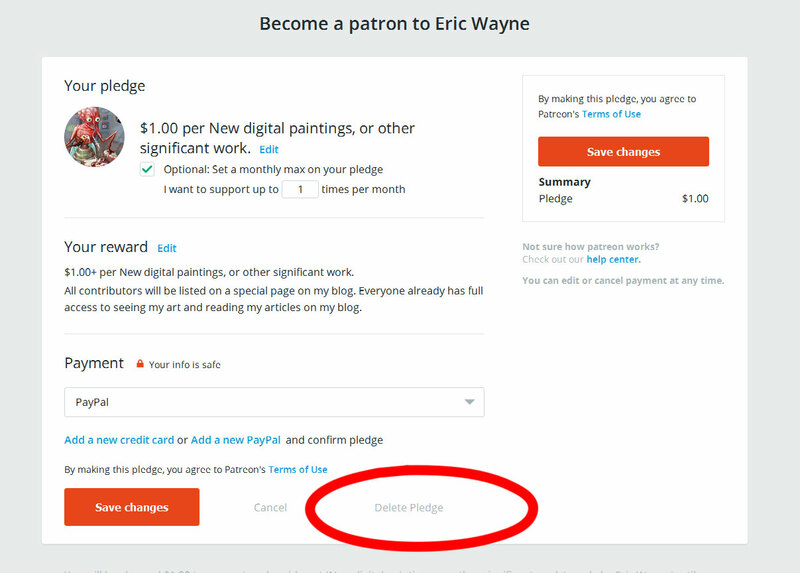 If you return to my page after making a pledge, you now have a new button to “Edit your Patronage”. 8) And if you want to cancel, it couldn’t be any easier. You just click on one button and call it a day. Hope you’ll consider becoming one of my patrons.